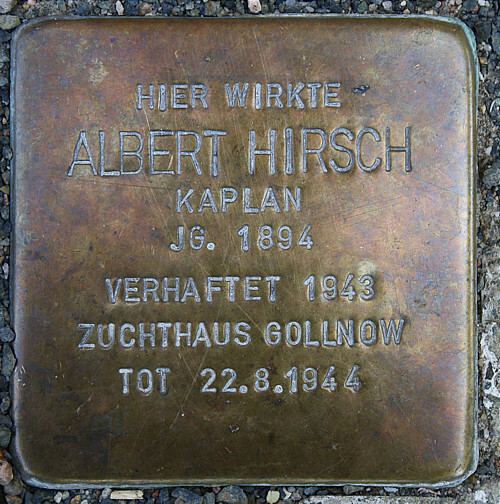 Albert Hirsch (1894 - 1944) was born in Charlottenburg and lived from 1926 to 1929 in Frankfurt, where he was a chaplain. Hirsch was modest and a well-liked pastor. He looked after poor farmers and sick and unbaptized children. Hirsch avoided state gatherings, did not return the party salute and listened to forbidden radio stations. This displeased those in power, so he was arrested by the Gestapo in 1943 and put before a special court. He was convicted and died in 1944 of hunger and exhaustion. He was one of the many victims from the persecuted Catholic Church.